In early 1970, a Japanese group called FLOWER TRAVELLIN’ BAND went to Canada. The first album “ANYWHERE” was released by Polydor Records and produced by Yuya Uchida. FLOWER TRAVELLIN’ BAND Performed and became good friends with Canadian rock band ‘Light House’ in the Osaka Expo’70, and later moved to Toronto in December. In 1971, the band signed with American Atlantic Records and Canadian GRT records released their second album “SATORI” in the U.S and Canada. They performed with Light House, Blues Project, EL&P and Doctor John and many others. The band has a hint of ethnic flavor with a melodic Asian rock twist. The single “SATORI PART2” charted at No.8 on the local Canadian charts. In 1972, FLOWER TRAVELLIN’ BAND released “MADE IN JAPAN” by Warner Records. They performed a welcome home show in Japan at The Tokyo Metropolitan Gymnasium. In 1973, they were billed to open for the Rolling Stones, but all concerts were cancelled because of visa problems. The fifth album “MAKE UP” was released by Warner Records. After performed at Kyoto Maruyama Park Outdoor Music Stage, the band took a long break. The Flower Travellin’ Band were formed from its parent body band; Yuya Uchida and The Flowers. The Flower Travellin’ Band consisted of Joe Yamanaka (vocals) from 4.9.1 - "Four Nine Ace", Hideki Ishima (guitars) from The Beavers, Jun Kobayashi (bass) from TaxMan, and George Wada (drams) from The Flowers. In the beginning, Yuya Uchida sang background vocals, tambourine and was an MC as a guest member. Then he devoted himself to be the producer of the band. The band performed in the HEAD ROCK OF THE THIRD WORLD (rock event held in Kyoritsu Koudo Auditorium in Tokyo) also starring Zuno Keisatsu, The Mops,The Golden Cups, and many other projects. This concert was the band’s official debut as The Flower Travellin’Band. The Flower Travellin’ Band performed at the 41st. NICHIGEKI WESTERN CARNIVAL with The Spyders, The Tigers, Rock Pilot, The Tempters, and other bands. FTB performed at The 3rd. JAPAN ROCK FESTIVAL in Tokyo and Yokohama. They also performed at the Hibiya Open Air Music Auditorium. Mops, The Golden Cups, Happenings Four and others also performed. The first single “Clash / Doop” performed with Terumasa Hino was released from Nippon Columbia. FTB performed at the Minimal Sound Of Rider in the Osaka World Expo. During this event, FTB made friends with the group “Lighthouse” who were in Japan performing at the Canada Pavilion in the Osaka Expo. This friendship spawned FTB’s expedition to Canada. Rock In High Land” at Fujikyu Highland with Zuno Keisatsu, Blind Bird, Mops, The M, and others. 42nd. Nichigeki Western Carnival” with The Spyders, The Tigers, Rock Pilot, The Tempters, The Wild Ones, and others. FTB decided to move to Canada. FTB performed Farewell Concert at Sankei Hall in Otemachi Tokyo. GARO made their guerilla debut performance during the intermission. Flower Travellin’ Band released the first album “ANYWHERE”. Joe Yamanaka and Hideki Ishima appeared as guest musicians on the album “KIRIKYOGEN” by Kuni Kawachi and His Friends. Flower Travellin’ Band performed as an opening act for “The Lighthouse World Tour” that started from Ontario Place, Toronto. They were highly accepted in many places and received raving reviews in many local newspapers.During this tour, FTB performed with EL&P, Blues Project, Chase, and many others. SATORI Part.2 became a hit, as it charted at #8 on the local music charts in Toronto. Single “Kamikaze / Heaven and Hell” was released from the album “Made In Japan” produced by Paul Hawfarrt, keyboard player of The Lighthouse. FTB 3rd. Album “Made In Japan” was released. Nobuhiko Shinohara (keyboards) former member of Happenings Four, joined FTB for their “Kikoku Gaisen Tour” (TRIUMPHANT RETURN TOUR). “Kikoku Gaisen concert” (TRIUMPHANT RETURN TOUR) at the Urawa Sitama Kaikan. 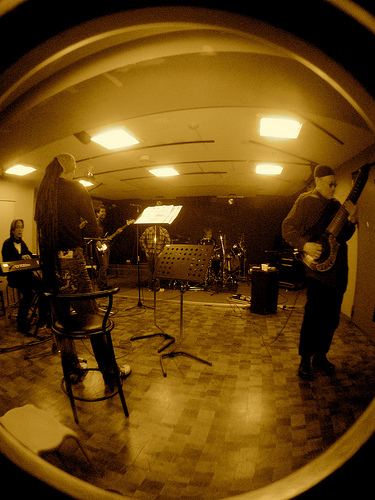 FTB peformed with Zuno Keisatsu, Yonin Bayashi, and the Anzen Band. Recorded live concert at the Yokosuka Bunka Kaikan. FTB performed at the 2nd. ROCK N ROLL CARNIVAL at Hibiya Open Air Auditorium. Carol, Funny Company, Vodka Collins and many others also performed. FTB took a long break after the concert Kyoto Maruyama Park Outdoor Music Stage. FTB’s first Greatest Hits album “TIMES” was released. FTB reunited and consisted of the FTB original members plus Nobuhiko Shinohara.